Dorm Leasing Office at Northeastern University gets honors in international modular Awards of Distinction. 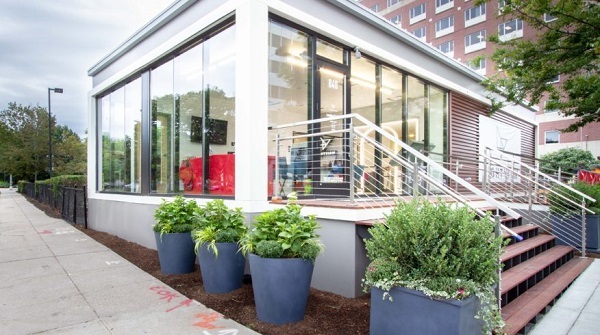 Triumph Modular won First Place in the Relocatable Modular Retail category for the Dorm Leasing Office at Northeastern University. In Las Vegas, we received this prize at the 36th annual World of Modular Awards of Distinction. As an international institute, the MBI awards program showcases top-of-the-line modular buildings from around the world. Consisting of 1290 square feet, the Northeastern Dorm Leasing Office is an innovative small building that punches above its weight. On one side of the building, there is a welcome area and leasing office. On the other side, there is a full-scale replica of one dorm unit. It includes a kitchen, living room, bathroom and two bedrooms. In a unique twist, one of the bedrooms has furnishings attached to the ceiling. Thus, students can easily envision the layout without stepping around furniture. As an off-site construction company, NRB manufactures modular buildings for commercial, institutional, industrial and multi-family residential clients in Canada and the U.S. We’re in the business of off-site construction, but we’re also in the business of changing minds. We want people to think differently about construction, and that’s where our entrepreneurial spirit and can-do attitude come in. Tell us about a project and we almost never say ‘no.’ We deliver buildings with all the advantages of modular construction while staying true to the original design. Serving the modular construction industry for 30+ years, the Modular Building Institute is the international nonprofit trade association. Members are suppliers, manufacturers and contractors involved in all types of modular building projects. As the voice of commercial modular construction, MBI expands the use of offsite construction. Through innovative construction practices, outreach, education to the construction community and customers, MBI promotes next-level modular thinking. If you would like more information about our award-winning building, click below.